It was the moments of student life and we all had a different set of a dream. Most probably, our curiosity was beyond the level of the horizon to hear each other past and present story more than how to study hard and make sure our future to bring to be true. Absolutely, we were conscious about our study and present scenario, but we didn't miss that opportunity sharing our feelings and story that was so fabulous. for joint study. Daytime would spend on a regular basis asking questions to each other, resolving the problems and helping to each other, but most of the night times we spent in the guff ships. Those were very pretty and exciting. We talked about our dream boy and discussed the type of men who could be our princes. We were from the different thought and background. We were growing up in a different culture and environment. Some of us were very open to sharing everything with friends and enjoyed telling the own story and some feelings with friends, but some were the very reserved type and never shared what kind and the type of her dream boy would be. I remember one of my friend Geeta who was born in Dharan but from the Chhetri family background. I don’t know the reason, but she never shared the type of her dream prince. She must be the luckiest one who found her prince without sharing with friends. I must be one of the most sentimental girls in the group. I remember we had gone to the dry picnic to Itahari and I forgot the name. I was sinking in the fantasy and had brought many cassettes to play on that day. Fortunately, I was saved by the Padma, she was quite intelligent and humorous who compelled us all to dance eventually in English pop songs. I just remember one song name might be “ my heart goes salala “ not sure it has been a more than a decade now. 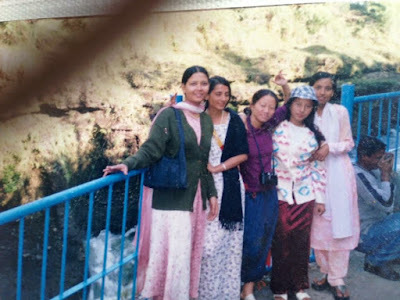 I remember Pramila who was close to me, I spent several nights at her home and she came to me as well sharing all pressure, pain, and happiness. We even spent the night on the roof as the weather was too hot. While we were sleeping, the rain began and he had hurriedly moved inside the room downstairs. It seemed like yesterday, but time has left us behind very far. She must have a grown up son now. But I don’t know the barrier between her and me we are not in touch even she reveals frequently in my memory. I met two of them last year. One had a five year of the girl with her and one was expecting. I had 15 months boys with me. I became glad at least they came to visit me and invited me to the gathering, providing the opportunities to see them together. It was the precious moments to spend the time with friends after almost more than a decade. I became very happy with them and having a time that revealed my past.